Better Together, TCU’s interfaith group, encourages students to engage in civil discourse about sensitive or debated religious topics. 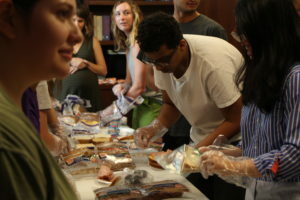 Through dinners, conversations, service and other activities, Better Together aims to teach students how to respectfully ask difficult questions of each other. The lesson in civil discourse comes as the nation struggles with a lack of civility and rancorous debate around a variety of subjects, not just matters of religion. Rather than politely suggesting ideas and listening to the opinions of others, people often attack each other, exacerbating the current political and social climates. “I want people to be more gentle with each other,” said Britt Luby, the adviser and TCU’s associate chaplain. Christianity, including its branches, is the largest faith represented at TCU. However, in meetings attended by about 10 students, there are not significantly more Christians than students who practice other religions, Luby said. In larger meetings, however, when 30 or more students attend, most of the students are Christians. 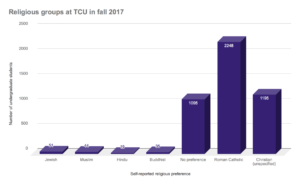 Christianity is the most common religion represented at TCU, but more than 20 Christian denominations are represented at TCU, showing the diversity even within one major religion. Luby said students tend to join Better Together after an event that sparks an interest in interfaith dialogue occurs. For example, some members of the group participated in the protest of the travel ban last year. They talked with other students who inspired them to want to know more about Better Together. Nasr Alkhabi, a senior social work major, has been involved with Better Together for three years. Alkhabi, a Muslim, said there were two or three other Muslim students in the interfaith group last year. “Better Together is the first step and the way to open my mind to other people, to accept others,” Alkhabi said. Brennan Steed, a senior political science and religion double major, joined Better Together this year. She said she did not participate in the group earlier because she did not know about it. “I joined Better Together because I wanted to get to know people of different faith groups,” Steed said. Steed has learned about various religious groups at TCU through the religious advisory council, but she said she hopes to make friends with and learn from people who practice religions other than Christianity, which is her faith. Steed said there were about three other Christian students at Better Together’s first meeting this year. “I hope to be able to articulate my experiences but also listen to others,” Steed said. Renee is a journalism major. She is dedicated to improving her journalism skills to effectively and ethically inform others.